In-vitro diagnostic services market size was valued at USD 44.0 billion in 2017 and is expected to grow by 5.4% CAGR from 2018 to 2024 . The global biosensors market is expected to reach USD 21.2 billion by 2020, according to a new report by Grand View Research, Inc. . The main factors that drive the market growth are high demand for miniature diagnostic devices and rapid technological advancements. In the recent years, the demand for disposable, simple, cost-efficient, and portable devices with fast response time has extensively increased. Point-of-care diagnostics (POCD) is essential for the rapid detection of analytes directly next to the patient, which provides fast disease diagnosis, monitoring, and management. The main component of POCD is the biosensor which is directly responsible for the bioanalytical performance of an assay. The biosensor is the result of achievements from medical science, chemistry, and nanotechnology. L-carnitine plays an important role in metabolic processes: the transport of fatty acids across the mitochondrial membrane , maintaining a balance between coenzyme A and acetyl-coenzyme A , removing poorly metabolized acyl groups , and participating in peroxisomal β-oxidation . L-carnitine deficiency may be connected with heart failure, diabetes, Alzheimer disease  and drug administration . The high morbidity and mortality of newborns  is associated with a group of genetic diseases linked to the dysfunctionality of L-carnitine transporters and transferases . Therefore, L-carnitine measurement for screening disorders in fatty acid oxidation is really important in modern medical diagnostics . Complementary metal oxide semiconductor (CMOS)-integrated circuit technology is a perspective and inexpensive platform for the fabrication of electrochemical microsensors . Compared to traditional electrochemical sensors, CMOS biosensors provide lower costs, lower power consumption and smaller sizes. Ion-sensitive field-effect transistor (ISFET) can be described as a conventional metal-oxide-semiconductor-FET (MOSFET) device, where the metallic gate is replaced by an ionic conductive electrolyte . Any process (enzymatic reaction, for example) that occurs in a gate solution leads to an analytical sensor response. ISFETs can be fabricated in a standard CMOS technology without additional post-processing steps, which reduces production costs and enables a compacted form of the chip. Combination of ISFET and enzyme carnitine acetyltransferase allowed obtaining a sensor for measurement of L-carnitine. For that, a CMOS-compatible ISFET with a Ta2O5 sensitive surface was developed and optimized for achieving high sensitivity towards processes in the liquid gate. Carnitine acetyltransferase was covalently immobilized on the ISFET sensitive surface. The enzyme, according to its nature, provides high selectivity and sensitivity towards L-carnitine that enables to detect the reaction directly without additional reagents. 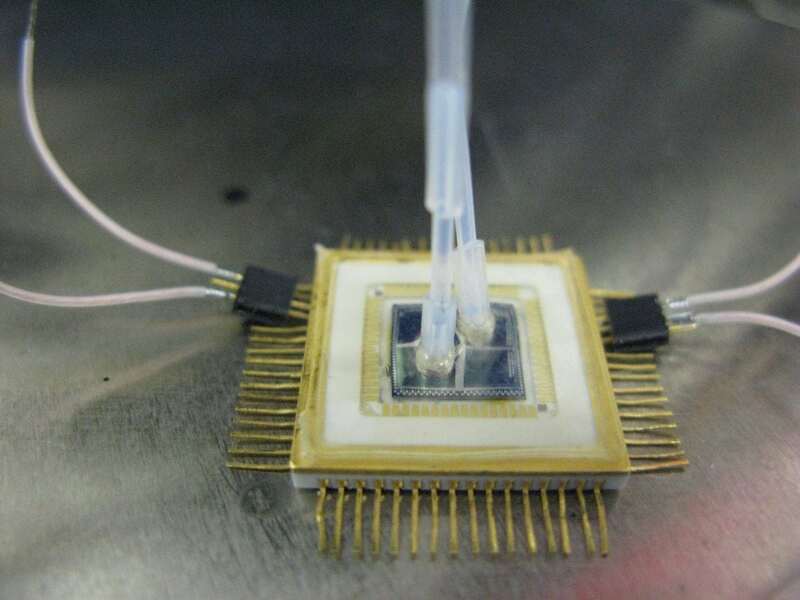 The complete microsystem consisted of a packaged chip, an immobilized enzyme and a microfluidic channel made of epoxy resin for reagent delivery. L-carnitine was detected in an artificial urine (1.3 μM). This makes the sensor suitable for measuring of real samples. The developed approach supports the concept of point-of-care diagnostics, where the whole sensor may be designed as a portable device with simple semi-automated measurements; it requires small sample volumes with minimum probe preparation, that overall impact the price of analysis. Results of this work were published in Biosensors and Bioelectronics  and supported by the Russian Science Foundation (project #17-79-20383). These findings are described in the article entitled CMOS-compatible biosensor for L-carnitine detection, recently published in the journal Biosensors and Bioelectronics. This work was conducted by M.S. Andrianova, E.V. Kuznetsov, V.P. Grudtsov, and A.E. Kuznetsov from the Scientific-Manufacturing Complex Technological Centre. Rebouche, C., Paulson, D., 1986. Carnitine metabolism and function in humans. Annu. Rev. Nutr. 6, 41–66. 10.1146/annurev.nu.06.070186.000353. Ramsay, R., Gandour, R., Van Der Leij, F., 2001. Molecular enzymology of carnitine transfer and transport. Biochim. Biophys. Acta – Protein Struct. Mol. Enzymol. 1546(1), 21-43. 10.1016/S0167-4838(01)00147-9. Vaz, F., Wanders, R., 2002. Carnitine biosynthesis in mammals. Biochem. J. 361, 417–429. 10.1042/bj3610417. Jakobs, B., Wanders, R., 1995. Fatty acid β-oxidation in peroxisomes and mitochondria: The first, unequivocal evidence for the involvement of carnitine in shuttling propionyl-CoA from peroxisomes to mitochondria. Biochem. Biophys. Res. Commun. 213, 1035–1041. 10.1006/bbrc.1995.2232. Evangeliou, A., Vlassopoulos, D., 2003. Carnitine metabolism and deficit – when supplementation is necessary? Curr. Pharm. Biotechnol. 4, 211–219. 10.2174/1389201033489829. Murphy, J., Marquardt, K., Shug, A., 1985. Valproic acid associated abnormalities of carnitine metabolism. Lancet. 325(8432), 820-821. 10.1016/S0140-6736(85)91481-3. Cox, G., 2007. Diagnostic approaches to pediatric cardiomyopathy of metabolic genetic etiologies and their relation to therapy. Prog. Pediatr. Cardiol. 24(1), 15-25. 10.1016/j.ppedcard.2007.08.013. Sharma, S., Black, S., 2009. Carnitine homeostasis, mitochondrial function and cardiovascular disease. Drug Discov. Today Dis. Mech. 6(1-4), e31-e39. 10.1016/j.ddmec.2009.02.001. El-Hattab, A., Li, F., Shen, J., Powell, B., Bawle, E., Adams, D., Wahl, E., Kobori, J., Graham, B., Scaglia, F., Wong, L., 2010. Maternal systemic primary carnitine deficiency uncovered by newborn screening: clinical, biochemical, and molecular aspects. Genet. Med. 12, 19–24. 10.1097/GIM.0b013e3181c5e6f7. Tran, D., Pham, T., Wolfrum, B., Offenhausser, A., Thierry, B., 2018. CMOS-compatible silicon nanowire field-effect transistor biosensor: technology development toward commercialization. Mater. (Basel, Switzerland) 11(5), 26. 10.3390/ma11050785. Kokot, M., Ossowski, T., 2009. Excitation-independent constant conductance ISFET driver. Metrol. Meas. Syst. 16, 631–639. Andrianova, M., Kuznetsov, E., Grudtsov, V., Kuznetsov, A., 2018. CMOS-compatible biosensor for L-carnitine detection. Biosens. Bioelectron. 119, 48-54. 10.1016/j.bios.2018.07.044. Mariia is a research scientist at the Scientific-Manufacturing Complex Technological Centre.